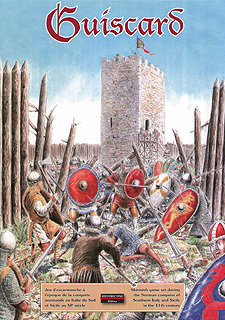 Guiscard is a skirmish game set during the conquest of Southern Italy and Sicily in the 11th Century by Norman mercenaries led by Robert of Hauteville, nicknamed Guiscard (which can be translated as The Cunning, The Wily or the Weasel). Each counter displays a unique character in various stances and health status. The various maps can be assembled in multiple ways to form varied terrains for the proposed scenarios. Guiscard uses the concepts and scale of the game of Cry Havoc series and all the maps and counters from Cry Havoc series are compatible with Guiscard.